Recently I was given the opportunity to try out some of BMFA's awesometastic rovings (Thanks Tina! You are the super most excellentest!) I was going to post about it earlier, but I thought I'd wait til it was spun up and do a before-and-after. 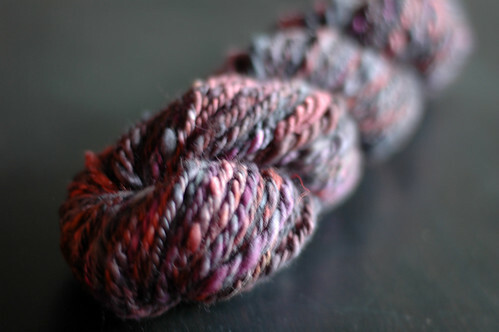 If you squint real hard, you can see that this is a skein of 50% Mulberry Silk, 50% Superfine Merino in Valkyrie. So shiny and yummy. Much prettier in person. Must rephotograph, sometime. Sigh. 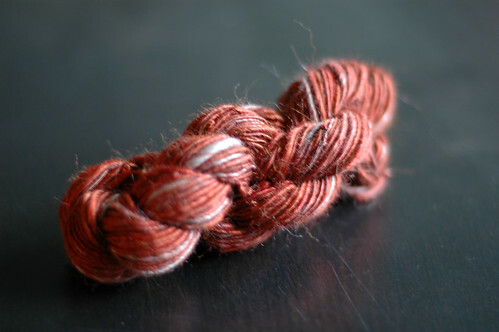 And here's a little baby skein of 70% Silver Alpaca, 30% silk in Copperline. Loooove this color. Fun to spin- I left it as singles for once, and should probably block it since I'm sort of shoddy at singles. Oh, those are all beautiful! I'm a very VERY new drop-spindler, so this is totally inspiring...especially since you used BMFA. I'm about to finish a shawl in some Socks that Rock and I cannot WAIT to get it off the needles and wear it. Their fiber is just so amazing! i love all of your yarns! i'm a long time knitter, but i've never tried to spin my own yarn before. 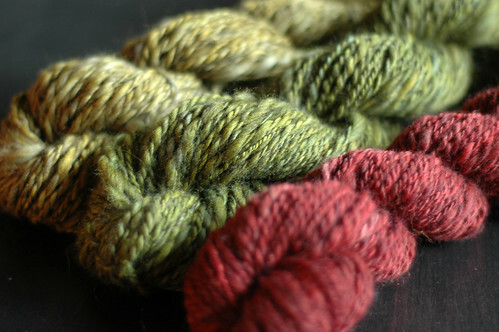 how would you suggest getting into spinning? i'm not sure where to get the wool or what tools to use. thanks! 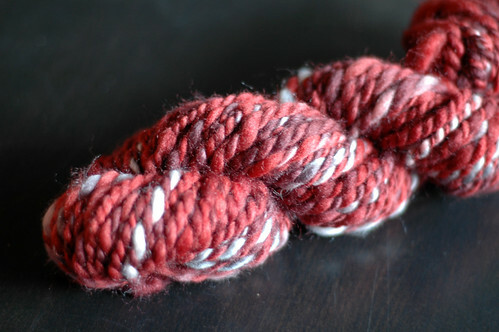 I started with a cheap drop spindle and some cheap wool roving off ebay (etsy is probably a safer bet though.) And lots of youtube videos and trial and error... it's a steep learning curve but eventually it clicks and you make something resembling string, haha. Once I got my wheel I never looked back, though, so you might want to see if there's anyone (maybe a spinner's group or a yarn store that sells spinning supplies) that can rent/loan you a wheel to try out. 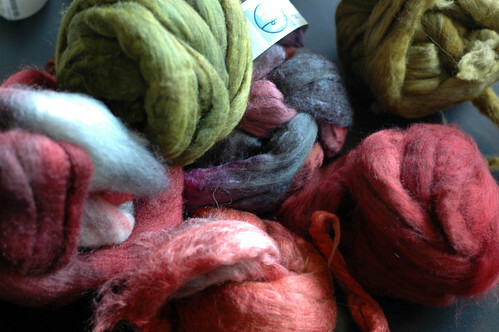 Usually you can try them out at fiber festivals too, if you have one in your area. I think they're easier than spindles, but some people would disagree.